Investigators are searching for the driver of a pickup who witnesses say intentionally ran down two Quinault tribal members at a campground, killing one and injuring the other. To mark his 20th birthday, Jimmy Smith-Kramer — a fisherman and father of twin toddlers — joined a group of friends for a camp-out over the holiday weekend along the scenic Humptulips River near Hoquiam. And before his birthday was over, Smith-Kramer would be dead. Now police are searching for the driver of a pickup that witnesses say intentionally ran over Smith-Kramer and his 19-year-old friend, Harvey Anderson, during a confrontation at the campground off Donkey Creek Road early Saturday. 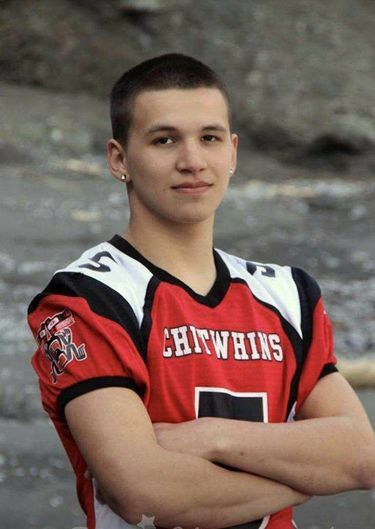 Both victims are members of the Quinault Indian Nation, which fears the deadly crime may have been racially motivated: Witnesses said the driver could be heard shouting racial slurs, the tribe contends. The incident started about 1:30 a.m. Saturday when a man driving what is described as a white, late-90s Chevrolet pickup began “spinning donuts and driving aggressively” on a gravel bar within the camping area, Grays Harbor County Sheriff’s Lt. Brad Johansson said Monday. Campers yelled for the driver to stop and, according to at least one witness, “a rock was thrown at the vehicle, possibly breaking the window,” Johansson said. The truck’s driver — described as a white, in his 30s with dark hair and a neatly trimmed beard — then started targeting campers and “backed over” Smith-Kramer and his friend, Harvey Anderson. The Quinault tribe disputed at least part of that account. “A rock was not thrown at the suspect’s truck until after two men had been run over,” a tribal news release issued Sunday stated. Smith-Kramer died Saturday night at Tacoma General Hospital. Anderson, 19, of Aberdeen, was released from the hospital Sunday, a hospital spokeswoman said. On Monday, tribal officials hailed Smith-Kramer as a hero, saying the truck fatally struck him while he tried to push Anderson to safety. Ralston, the tribe’s former police chief who was not at the campground Saturday, said he raised Smith-Kramer as his own grandson and described him as athletic and outgoing. After graduating from Tahola High School, Smith-Kramer earned a living as a commercial fisherman and fathered twins — a boy and a girl, who are now nearly 2, Ralston said. Sheriff’s detectives, who are investigating the case as a murder, are now seeking the public’s help. The pickup was lifted and had an extended cab, Johansson said. A woman and another male may have been passengers in the truck during the incident, he added. “There was one witness saying they heard a female in the vehicle yelling to the driver to stop as he was backing up toward the two males,” Johansson said. Anyone with information is asked to the Grays Harbor County Sheriff’s Office 360-533-8765. Information in this article, originally published May 29, 2017, was corrected May 30, 2017. A previous version of this story gave an incorrect last name for Jimmy Smith-Kramer.